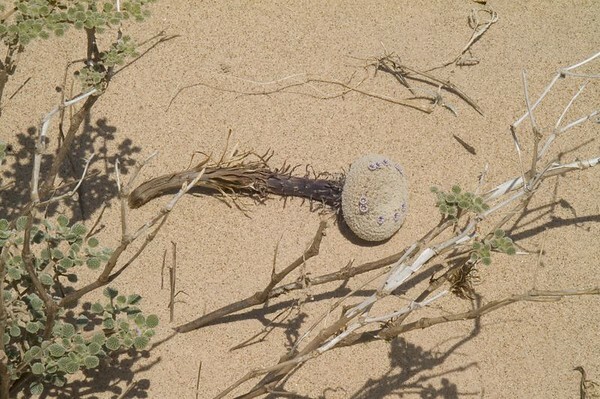 This has a thick, scaly stem that may extend 6 feet (2 m) or more into the dune where it attaches to the roots of nearby shrubs deep in the soft sand. 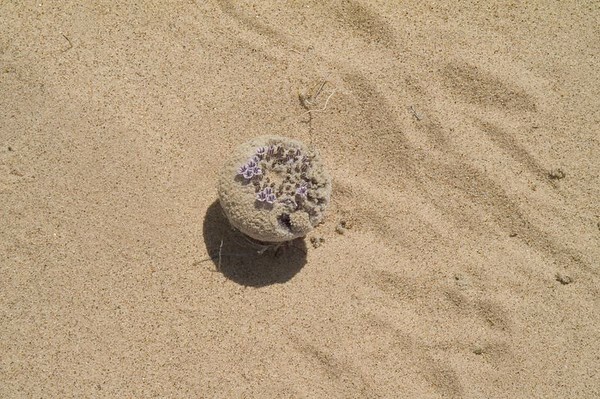 The entire plant lives below the surface of the sand, with only the flower head pushing above sand during early spring. Just for some fun... What is It? Is your spouse an ASA member??? Numbers count!! How many of you have ever seen a Sand Food? Or I'll post it when I get home. Don't fear death, celebrate life. I had never seen one until the last time I took Dr. Phillips out on his PMV counts. I had seen plenty of photos but never seen one in the wild. Then one was pointed out to me. Suddenly I was seeing them everywhere. What got me is they always looked bigger in the photos than they are in real life. Once I knew what scale to be looking for they were easy to spot. 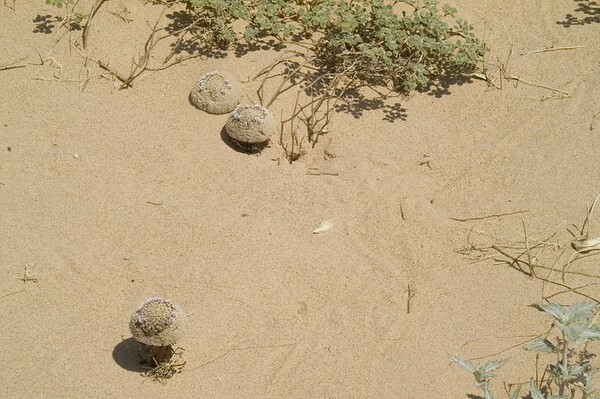 Sand food is a root parasite with a thick, scaly stem that may extend 6 feet (2 m) or more into the dune where it attaches to the roots of nearby shrubs deep in the soft sand. 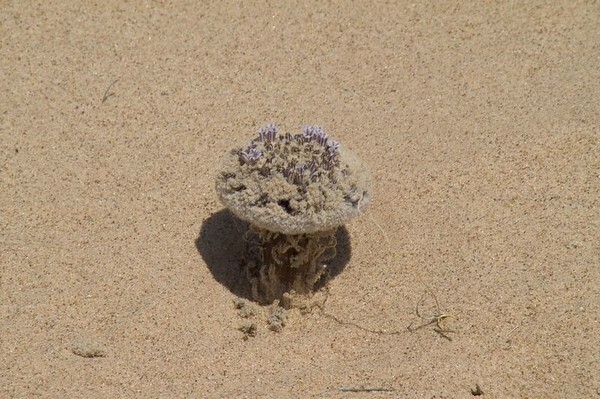 The entire plant lives below the surface of the sand, with only the flower head pushing above sand during early spring. The scaly stem is without chlorophyll and is nonphotosynthetic, and all of its vital organic nutrients (amino acids and carbohydrates) come from nearby host shrubs. An old, dried flower head with a long, subterranean scaly stem superficially resembles a sand dollar attached to a long piece of seaweed. In the early 1930s, Franklin A. Thackery discovered 106 sand food plants arising from a single arrowweed plant near an irrigation canal in Imperial County, California (north of Calipatria). The host plant weighed just over one pound, while the 106 sand food plants weighed 46 pounds. In this remarkable case, the parasite outweighed its host by more than 3600 percent. Of course, most of the sand food's combined weight was water stored in its fleshy tissues. Thackery concluded that the parasite was not overtaxing its host, and was absorbing water on its own to supplement that which was provided by the host. The best "patchs" of them (highest density per square foot) I have ever seen are by the pit toilets at Midway campground in the south dunes. They grow all around the slabs of cement. Yep, a parasite that absorbs water - what do you think they might be feeding on there? If "pro" means yes, and "con" means no, is Congress the opposite of Progress? Nice game, may be flower or any death things is there. Its nothing but a kidding. Well it ad good to think. [quote="chrisssteeven"]Nice game, may be flower or any death things is there.